What is a Business’s Contribution Margin? 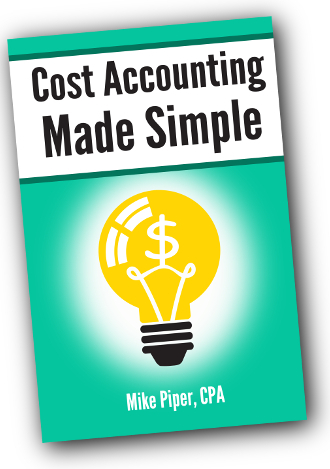 The following is an adapted excerpt from my book Cost Accounting Made Simple: Cost Accounting Explained in 100 Pages or Less. EXAMPLE: Joe has a food truck from which he sells tacos. In the month of July, his fixed costs were $900, his total variable costs were $4,000, and his revenue was $10,000. Joe’s contribution margin is $6,000 (i.e., his revenue minus his variable costs). Contribution margin is particularly helpful when looked at on a per-unit basis. The per-unit contribution margin for a product is the difference between the product’s selling price and the per-unit variable costs necessary to produce the product. In other words, the per-unit contribution margin for a product is the amount that each unit of sales contributes toward the company’s profits. EXAMPLE: Joe sells his tacos for $5 each. His variable cost per taco is $2. His contribution margin per taco is $3 (i.e., $5 selling price minus $2 variable costs). Each taco sold contributes $3 toward covering his fixed costs. And after his fixed costs are covered for the period, each taco sold contributes $3 of profits. One common way to use contribution margin per unit is to find a business’s “breakeven point”—the number of units the business would have to sell in order to precisely break even in a given period. EXAMPLE (continued): What is Joe’s breakeven point? That is, how many tacos does he have to make and sell in order to break even in a given month? Again, we know that Joe’s fixed costs are $900 per month. And we know that his contribution margin is $3 per taco. (That is, each taco sold contributes $3 toward covering his fixed costs.) We can calculate his breakeven point by dividing his fixed costs by his contribution margin per unit. We can also calculate how many units of a product must be sold in order to achieve a given level of operating income (i.e., profit before interest and income tax expenses). As we discussed previously, a company’s contribution margin is equal its revenue minus variable costs. Another way to state that would be to say that a company’s contribution margin is essentially its profit before considering fixed costs. For example, if Joe wants to earn a profit of $5,100 in a given month with his taco truck business, and his fixed costs are $900 per month, how much contribution margin would be required? That is, how much contribution margin would be necessary to cover Joe’s fixed costs and still provide the desired level of profit? If Joe’s contribution margin per taco is $3, how many tacos will he have to sell in order to reach his desired level of operating income for the period? In managerial accounting, businesses will often prepare an income statement (such as the one below) formatted in a way that highlights contribution margin. With a traditional income statement, you begin with revenue, then subtract cost of goods sold (which includes both variable and fixed production costs) to arrive at gross profit. Then you subtract selling and administrative expenses (both fixed and variable) to arrive at operating income. In contrast, with a contribution margin income statement, all variable costs (i.e., variable production costs as well as variable selling and administrative costs) are grouped together and subtracted from revenue to arrive at contribution margin. Then, all fixed costs (both production-related ones as well as selling and administrative ones) are grouped together and subtracted from contribution margin to arrive at operating income. Contribution margin refers to a business’s revenue minus variable costs. Contribution margin per unit is equal to the per unit selling price minus the per unit variable costs. In other words, it’s the amount that each unit of sales contributes toward the business’s profits. When you know the contribution margin per unit, you can find a business’s “breakeven point” — the number of units the business would have to sell in order to precisely break even in a given period.